Department of Art | Get Close to the Action at SoT's Spring Awakening! 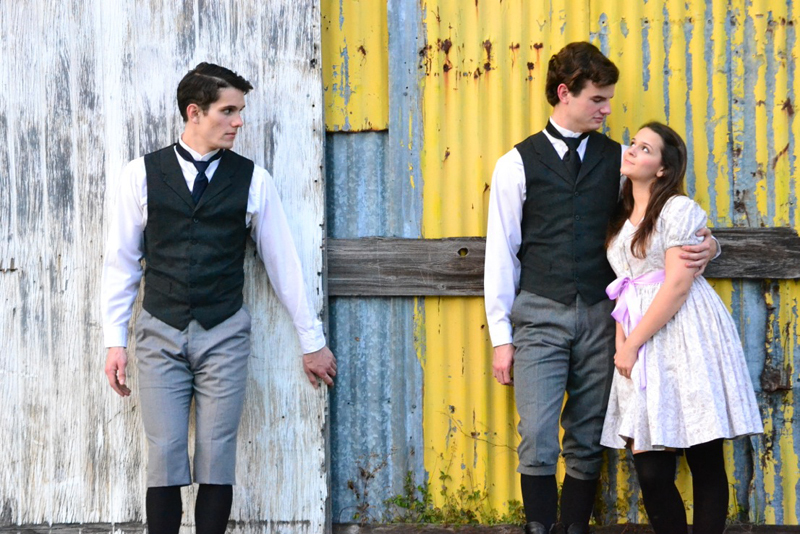 Home » News » Get Close to the Action at SoT's Spring Awakening! Get Close to the Action at SoT's Spring Awakening! This eight-time Tony Award-winning rock musical sensation is an adaptation of the controversial 1891 German play by Frank Wedekind. Audiences are taken on a whirlwind of a journey that explores the world of teenage sexuality and how it can lead to love and demise when left in the dark. Sweetly curious Wendla Bergmann, played by Collean Gallagher is an adolescent girl searching for meaning behind “where babies come from.” She then turns to her mama for answers she cannot uncover on her own; however, due to the prudish nature of the time, her mother cannot bring herself to explain the obvious reality of the situation. Rebellious and undeniably charming Melchior Gabor, played by Nick Jones, and long-time friend and intense introvert Moritz Stiefel, played by Rico LeBron, certainly have some issues of their own. While reciting lines of Virgil in Latin their minds drift away to thoughts of pure frustration and utter desire. Spring Awakening speaks to all who yearn for further insight to the sexual and spiritual passage that we struggle to understand. The story hits close to home for audiences (quite literally – you can sit on stage!). Director Fred Chappell relays that there really is something to be said for the powerful emotional impact that this production possesses. “I always find that if the cast and I are excited about the piece of work, then usually audiences are too,” Chappell remarked. To purchase tickets online at http://tickets.fsu.edu, in person at the Ticket Office located in the Fine Arts Building, or via phone (850) 644-6500 during normal business hours (Tuesday-Saturday) between 11am-4pm. Senior Ticket (Age 62+): $18.00. Young Professionals’ Night: $10, Feb. 28 @ 8:00pm, call (850) 644-6488 for details.